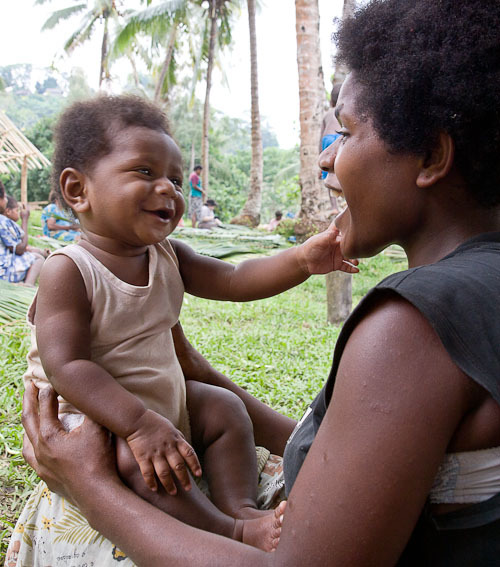 Meet Marie and her 6 month old bundle of joy, baby Steve, enjoying a moment together. They live in a Merei speaking village deep in the bush on the island of Espiritu Santo, Vanuatu. Marie’s husband, and Steve’s daddy, Norman, is the minister for the village and the primary Bible translator. In the background, you can see women weaving ‘roof tiles’ for the new translation office that the whole community is pitching in to build. Baby Steve won’t know how lucky he is to someday read God’s message and be able to understand it. Brad and I were blessed to visit this community in July 2009. The village was so welcoming and accommodating to our strange western ways. Brad went ‘bamboo hunting’ with the men, dragging huge logs out of the jungle. Marie looked after me, showing me how she cooks a big feast of taro and how to weave pandanus into roof tiles. I always had my camera with me, hoping for a moment to ‘capture’ the beautiful intimacy of their community. I only had two batteries for the 10 days I was there, and would lie awake at night in the tent praying that the batteries would last. I must have taken thousands of photographs. Thank God the batteries held out, and I can look back on images like this one with joy and gratitude to our great God and all the good things he shows me as I serve Him.